What other games (if any) provided the inspiration for Super Bat Puncher? Where did the concept of a game based around a novelty punch attack come from? 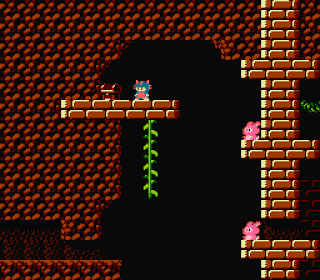 Spelunky has been a huge inspiration in the beginning. As for NES titles, Gimmick and Ufouria/Hebereke should be mentioned. The initial idea was to create a game to vent your frustration on what is possibly the most cliché type of video game enemy there is, hoping to put an end to the need of bats in games once and for all! Being able to punch the living daylights out of these little fellows with your bare fists sounded wonderful, but I struggled to create a convincing animation of it working in the tight 16x16 pixel space that is used for the main character. Hence, the extendable punching glove was born. Ca65, which comes with the cc65 package downloadable at www.cc65.org, was used to create an NES rom from the source code with the aid of Makefiles. Custom editors for maps and sprite animation were created specifically for the project. The graphics were drawn in YY-CHR. It's hard to explain how all of these tools work together in just a few sentences. If you'd like to know what goes into making an NES game or even learn how to make one yourself, I can recommend these tutorials. During development, emulators were used almost exclusively to test the game. Occasionally, I would take advantage of a PowerPak to see if it still worked on the actual console. SBP is the first game that you've released for the NES under the Morphcat label, but given your obvious skill as an artist and ASM programmer I assume that you've worked on other game projects in the past (either as an artist or programmer)? If so, what is your game development history? Apart from projects that never got anywhere there was "Project P", another platformer for the NES which has been put on hold in favor of SBP. You can find information about it on my blog. When I initially emailed you regarding SBP, you explained that you were overwhelmed by the response the game was getting. Were you genuinely surprised, and has this positive feedback motivated you to continue work on the full version? Of course I was and the overall response is indeed very motivating. However, I am worried about its popularity stemming mostly from the fact it actually runs on the NES. The full version will aim to be a good indie game regardless of the platform. You mention on your blog that you will be taking a break from development. Is there any target release date that you have in mind for the full version of SBP, and would you like to see the game receive a small-run commercial cartridge release? There is no target release date, I will take all the time that is needed to finish and polish the game. Cartridge release? That's on my list! Are there any other projects that you have planned for the future? There is a small Android game with a simple, but addicting concept I have been working on sporadically. Apart from that there are plenty of game ideas floating around in my head which I would like to realize someday. Vintage hardware enthusiasts any hobbyists all have their own reasons for chosing to continue working on dead hardware. What is it about the NES (and related scene) that you love, and do you think that the machine will still have a loyal following in ten years time? Making an NES game has been a childhood dream of mine. I did not own the console back in the days, but I have fond memories of playing games such as Mega Man 2, Kirby's Adventure and the Super Mario Bros. series at a friend's house. Apart from that, limitations on the NES actually mean something. You are usually not trying to push the hardware to its limits or compete with commercial games when making a retro game for a modern platform. I believe people will still love the NES even when most of the original consoles no longer work. The console spawned so many successful franchises, it can hardly be ignored. With regard to NES homebrew, are there any recent releases that you'd like to recommend to people new to the scene? Yes, NES Virus Cleaner! It's simple, but addictive. You should also stay tuned for Battle Kid 2 which doesn't seem to be far from completion. Thank you for participating in this interview. Is there anything else that you'd like to add before signing off? Thanks to everyone who played the demo of Super Bat Puncher and to those who gave feedback. It will surely help in making the game better.